Basil Bunting, Complete Poems, ed. Richard Caddel, Bloodaxe, Newcastle, UK, 2000. 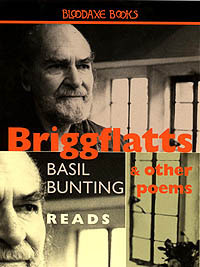 Basil Bunting reads Briggflatts & other poems, a two-hour double cassette, also from Bloodaxe. Basil Bunting on Poetry, ed. Peter Makin, John Hopkins, Baltimore & London, 2000. 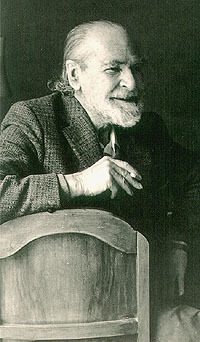 THE CAREER of Basil Bunting, who would have been one hundred this year, is now sufficiently well-known that it hardly needs repeating: co-dedicatee in 1934 with Louis Zukofsky of Pound’s Guide to Kulchur, he remained a ‘struggler in the wilderness’ until his mid-sixties when the publication of Briggflatts, his last substantial poetic work, brought belated critical recognition of his centrality to any version of Modernism in the literature of Britain in the twentieth century. A list of his contacts and influences is a rollcall of essential figures: apart from Pound and Zukofsky, one could mention Yeats, Eliot, Ford Madox Ford, David Jones, MacDiarmid, Mina Loy. He knew his work would stand comparison with any and throughout the years of neglect trimmed and cut and threw away with the kind of conviction that only a poet utterly assured of his craft could manage; so that his complete poems — augmented in the present edition to include all the writings he more or less released in his lifetime — remains, like the editions he personally oversaw, a relatively slim volume. I don’t want here to justify claims for Bunting’s importance; if it hadn’t already been done sufficiently by others (a short critical bibliography is included in the foreword to the Poems) the poems will do it for themselves. They are, as Bunting said of Pound’s Cantos, as solidly formed as the Alps; ‘you will have to go a long way round/ if you want to avoid them’. Ignore them, dislike them if you will, but it would be foolish to deny their stature. There may be a host of reasons why Bunting is still perhaps relatively under-estimated, but the poems aren’t going to shift from the path; sooner or later a committed reader is bound to have to take account of them. Nor do I want to argue, though Bunting himself surely would have, about whether all the poems that appear here should be included in the book. The editor, Richard Caddel, presents convincing arguments for the inclusion of material that Bunting, at the time of his death, had not included in the complete poems. Bunting, who famously pruned chunks from Shakespeare’s sonnets, was the severest of editors. If he preserved work it was not because he was casual about his manuscripts; everything printed here Bunting chose to publish or circulate at one time or another. Caddel has respected Bunting’s own arrangement of the poems and has presented the uncollected work separately. If all this makes Bunting turn in his grave then I think we can only placate his crusty ghost by offering it a glass of rum and relishing the reading of the poems. For ultimately it’s what Bunting wanted — that we should relish the reading of the poems. He will have been all too aware of the sort of argument that would dismiss criticism as at best a distraction from, and at worst a trashing of, the pertinence of poems when read aloud. He came close to saying as much. He must have known Heidegger; he certainly had read Chomsky: if some hapless student can discover the traces, there’s a future thesis to be written on Bunting and linguistics that would thoroughly enrage his ghost. But his resistance to criticism (in any case incomplete: he happily recommended Hugh Kenner’s work) and insistence on reading aloud had little to do with a mystique about performance. It wasn’t the truth of an improvised Present that mattered to him, or the sort of concern that led Williams to articulate the occasion of the poem as an essential ‘embodiment of knowledge’. His craft at root derives from that simple motive: to communicate, to please, with patterns of sound. Readers can try to build whatever edifice they like on this foundation, but they would misread Bunting if they ignore it. Fortunately we don’t have to. A reader who hesitates to follow Bunting’s advice to the letter — read aloud — has now two cassettes of him reading his own work easily available, plus the texts of a series of lectures he gave at Newcastle between 1969 and 1974 in which he reveals how his own reading in the history of English poetry is an extraordinary hearing of verse. These lectures make a fascinating read. For a start they are edited by the most accomplished and thorough scholar of Bunting’s work that we have. Makin’s introduction is a wonderfully succinct and stimulating invitation to the poems; if he tends to read the score for the music, he nonetheless gives us as precise a summary as we could hope for of Bunting’s insights. The main argument can be sketched quickly. Bunting assumes that art is shape, not content. There is no excuse, of course, for decoration: it simply spoils shape. In this art, in the English language, rhythm is the most essential shapable: and if the poet has the rhythm right, he probably needs nothing else to give main form to his poem.... But rhythm, the whole key to English verse, Bunting says, has to be made by English means. Languages vary in their constitutions; what has force in one may have little in another; stress is the key to English, though not to French. The cure is, first, a return to the essential of English, which is the play of strong stresses, irrespective of overall syllable count...; second an ear for music, for music is the true parent of poetry. The flexibility and intricacy of song as a frame for words taught Wyatt and Campion to bring forth words equally varied and alive in their cadences. So Bunting advanced Wyatt from the status of a minor poet with dubious control over his material (in 1970, Muir’s edition of the poems was still hardly canonical), to the ‘effective founder of modern English verse’ — ahead of Chaucer. For Bunting heard that Wyatt was writing to a musical line rather than to the predictable metrical patterns foisted on him by Tottel with which his reputation was right royally scuppered for 400 years. Bunting almost certainly exaggerated the extent to which Wyatt’s words were intended to be sung (there seems not a shred of evidence to make the claim for the sonnets, and still only limited direct evidence for many of the lyrics: Bunting — quite reasonably — would have replied that the evidence was in the lines themselves), but it hardly matters. Wyatt has left us poems whose ‘flexibility and intricacy’ arises from their adherence to music rather than metrics, and Bunting seized on them as a means to invigorate his own lines. At exactly the time that Pound was inventing his Propertius and clipping The Waste Land into shape, Bunting found his own solutions to the ossified poetic habits of preceding generations in a rehabilitation of the musical methods of Wyatt and, further back, the stressed line of early British poetries. This is what aligns him with Pound and Eliot. Without Wyatt and Beowulf, without having read them aloud and registered the movement physically in the voice, without having felt his mouth working round their rhythms, suppler than anything he could have taken from nineteenth century practice, Bunting’s craft would surely have been slower to develop. Not that one can doubt that it would have developed anyway. The appendix to the Complete Poems prints the two pieces of juvenilia that were published in Bunting’s youth, both remarkably conventional given that Bunting knew and already admired Whitman. But only a handful of years later, at the age of 25, he published Villon, the first of his ‘sonatas’, a poem managed with such accomplishment that it resembles the mature work of a writer who has long since assimilated the influences that will be of most use to him. Bunting seems to have been gifted with the kind of conviction about himself and his work that permitted him to reach directly what he needed without having to search around clumsily amongst eventual dead ends like most young writers. I don’t think this is attributable simply to the rigour of his editing. Not the least fascinating feature of Makin’s edition of the lectures is where they choose to begin: not with poetry at all, but with the Codex Lindisfarnensis and the astonishing graphic art with which Northumbrian monks and scholars embellished their manuscripts during the Dark Ages. Bunting actually insists that ‘I’m not going to explain the bearing of all this on poetry’, although he then proceeds most effectively to do so. As interesting to readers of Bunting, however, is what his view of Northumbrian art says about his own work. Just as his anthropology looks speculative if not downright bogus when he argues about the possible origins of poetry, scholars could no doubt quarrel with some (though not a lot perhaps) of his commentaries on Northumbrian art; but the pertinence of his words is of another order. There seems at first to be a confusion of detail and decoration, but the balance is never lost, and the main design shows through, ultimately, without insisting on itself.... The detail intertwines and repeats, and yet the richness of the detail never obscures the balance, the beautiful balance and symmetry of the main design.... [There’s] much more to it than the hearer or beholder realises at first. [It wasn’t done] by guess; it required some pretty complex geometry, a whole system of intricately related and balanced ratios. There isn’t a page of the Complete Poems that isn’t testimony to the same skills. Briggflatts is the example par excellence and one could spend hours unravelling its symmetries. But if the poet has spent so much effort to make a design that doesn’t ‘insist on itself’, it would be a folly and impertinence to try and do it for him. The design manifests itself when the poem’s heard. The cassettes of Bunting reading would be worth having even if it was only for his rendering of Briggflatts. They allow us to hear how his pacing of the final pages completes the aural design of the whole as decisively as any recapitulation in the sonatas of Scarlatti, selections from which Bunting intended to punctuate the poem though they were unfortunately unavailable for this recording. But one can as easily illustrate aural design in the short poems. The design here doesn’t need spelling out though it merits some study for the play of rhyme, internal or half-rhyme and repeated vowel shapes is too subtle to take in at a glance. The point is that, like the song of the common song thrush which is distinctive for both its variety and its repetition, the sounds are structured into an intricate pattern. They determine the form. This is Bunting’s answer to the problems posed by a poet such as Spenser, who can make sounds that glitter in the ears but who too often fails to make them function structurally because he wanted them to serve, in Bunting’s view, alien rhythmic methods. It’s this, I think Bunting would say, that gives pleasure in reading aloud: we can hear the craft of the poet in the detail of the lines, but we sense too the larger structures that emerge as the poem unfolds in time. These are lost in silent or interrupted reading just as effectively as they are lost if a piece of music is stopped in mid-course. It’s surely at this point that Bunting collides with the poetics of a man like Olson, for whom one might expect he would have some sympathy. Form, for Bunting, is manifest at the moment of reading because of the poet’s previous labour to get the structure sounding right: the ‘main design’ is realised, but not created, by the voice. Olson on the other hand viewed form as one more extension of the content of the occasion, altered, augumented, reshaped with each advancing syllable, so that the ‘main design’ might not be settled in advance. Just as can happen in the music of a composer like Cage who consciously welcomed unpredictable interruptions, so Olson’s poems when he read could be diverted in mid-course, but neither poems nor music, in their maker’s view, should be seen as being deformed by it; on the contrary, their form might be renewed by such interventions. One might situate Bunting historically by his choices in this debate. He knew there was further to go along the routes he had opened up and made deliberate decisions about the distance he wished to travel. He far preferred audacious experiments that fail to tried-and-tested methods whose success is guaranteed in advance. He loathed pretention and respected risk-takers. At the same time he required utter dedication to craft. He rejected ‘open field’ writing, as readily as he dismissed ideas of form as ‘organic’. His obstinacy and rigour steered him clear of improvisation, but his essential good humour and generosity allowed him to enjoy the inventiveness of children playing and the spontaneity of popular forms like ballads and blues. For a whole range of poets today he offers a way forward in the writing of poetry in English whilst simultaneously, because he lived at the cusp of a revolutionary period, revealing a way back to its roots. Bunting is also situated historically by his reading style. There is a grandeur learnt from Yeats and Pound (though they were all at Rapallo at one time or another and it’s hard to know who influenced whom), yet there is also a down-to-earthness in his rendering of poems such as ‘What the Chairman Told Tom’ much more typical of reading styles today that it’s hard to imagine the senior poets gladly adopting. He read to collaborate with those who listened. Not that his voice is ever casual, and he’s almost never rushed, but equally there’s nothing in his style that seems affectedly poetic. He rolls his ‘r’s on a prolonged rising note that might seem contrived if the listener is unaware that this is typical of the Throckley accent in the part of Northumberland from which Bunting’s mother’s family came. As Caddel and Flowers explain in their portrait of the poet Basil Bunting: A Northern Life, available from the Basil Bunting Poetry Centre in Durham, Bunting’s accent is ‘the highly specific, local language from the place where, and the people amongst whom, he spent his childhood’. So that one can say finally that his reading style situates him geographically as well. Not the least of the virtues of his example to poets writing now is the conviction he shared with such poets as Niedecker and Williams and Olson, that in an age when language is homogenised so easily because so easily transmitted, the words that arise as the particular result of contact with a particular place are likely to be the truest: the local is indeed the only universal. But I think we should value Bunting too for some of the things he didn’t say. He knew, as a musician knows, the meanings of silence. Words may speak, so may their absence. Pound was crucial to Bunting but he didn’t hesitate to reject Pound in hectoring mode. Pound sought to impose himself on silence. Bunting knew better how to keep things in proportion. His modesties were simple. I had too few chances to talk with him, though I remember exactly what was said on the first occasion we met. We found ourselves standing on a threshold one easy summer evening, looking at the stars. They can’t have been immensely bright for there was too much ambient light. Eventually though after a long pause, without turning towards me, he remarked ‘nice night’. I agreed. Which was the whole conversation and no more nor less necessary and complete than the occasion required. It wasn’t merely a sociable gesture — in the silence he had taken measure: he meant exactly what he said.